The stoneware pottery of James Rhodes, one of the few known American stoneware potters of the colonial period, is highlighted in a fascinating exhibit curated by Richard Hunter, Rebecca White, and Nancy Hunter. 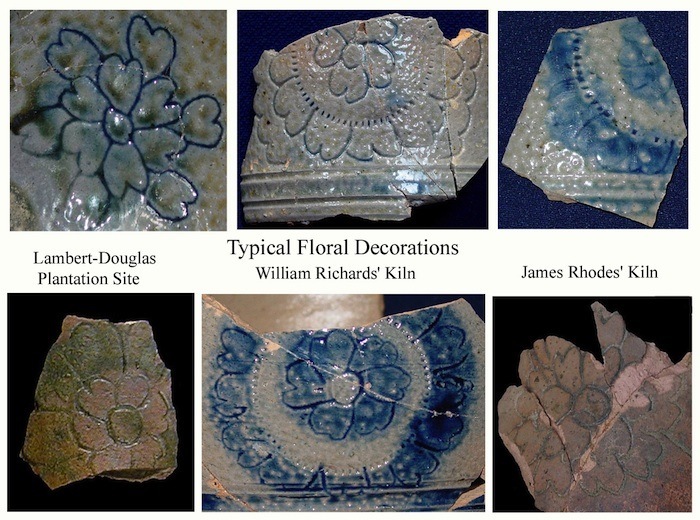 The existence of James Rhodes and his distinctive wares has come to light over the past decade following the archaeological discovery of two kiln sites within the City of Trenton and some painstaking historical research into colonial documents. First, in the spring of 2000, a pottery kiln was discovered on the Lamberton waterfront during the construction of the Route 29 tunnel. Some 13,000 sherds and pieces of kiln furniture (items used to help in stacking pots in the kiln during firing) were retrieved from this site. The kiln is still intact, buried beneath the tunnel roadway. In 2005, a second kiln was found a mile from the first in the backyard of the Eagle Tavern property on South Broad Street during the City’s restoration of this local landmark. Hundreds more sherds were recovered. Research into documents and analysis of the artifacts established a link between the two sites. It is now believed that James Rhodes operated the waterfront kiln from 1774 until 1777, working for the prominent Philadelphia merchant, William Richards. Then, from 1778 until his death in 1784, Rhodes ran his own pottery-making business on a property adjoining the Eagle Tavern site (which later became part of the tavern property). Despite our knowledge of James Rhodes’s activities over the ten-year period he was in Trenton, virtually nothing is known of his earlier life. The exhibit explains the discovery of the kilns and the archival research, but focuses mostly on displaying the extraordinary variety of grey salt-glazed stoneware products made by James Rhodes. Many of the items on display are fragmentary, a result of their archaeological provenance. However, among the reassembled vessels, visitors can view plates, dishes, bowls, cups and saucers, tankards, jugs and pitchers, coffee pots, teapots and ointment pots, along with numerous pieces of kiln furniture. Rhodes employed some signature decorative motifs that distinguish his products from those of other potters – floral designs and rough geometric patterns, executed in naturalistic style in painted cobalt blue – but perhaps his most engaging trait was the quirky application of molded faces on to the shoulders of some of his jugs and pitchers. This exhibit is being curated by Richard Hunter, President of Hunter Research, Inc., a Trenton-based historical and archaeological consulting firm, and Museum Society board member; Rebecca White, Archaeological Laboratory Director, URS Corporation; and Nancy Hunter, former manager of Gallery 125 in downtown Trenton. Richard Hunter has had a lifelong interest in the archaeological study of pottery. Since the late 1970s he has nurtured a particular passion for New Jersey pottery and has explored and analyzed numerous pottery manufacturing sites ranging from redware kilns on Sourland Mountain to colonial stoneware kilns in central New Jersey to the vast industrial complexes from Trenton’s pottery making heyday in the late 19th and early 20th centuries. Rebecca White has worked for 14 years as a laboratory director in the field of cultural resource management, first at Hunter Research in Trenton and since 2008 for URS Corporation in Burlington, New Jersey. Rebecca’s wide-ranging research interests have included a focus on the material culture of historic industrial sites and she has an extraordinarily detailed knowledge of the products of James Rhodes and other American colonial stoneware potters. Nancy Hunter has a background in art history, legal services and contract management. From 2004 to 2006 she was Gallery Manager of Gallery 125 in downtown Trenton where she coordinated numerous art exhibits, including the Russian painting exhibit, which coincided with former President Mikhail Gorbachev’s historic visit to Trenton in April of 2005. She presently serves on the Exhibits Committee of the Trenton Museum Society.